Regular readers of AutoSpeed will have consumed numerous articles on how to modify their cars to improve power while avoiding detonation, including a wide range of articles on how to keep intake temperatures down. But it isn’t just high performance cars that can suffer. 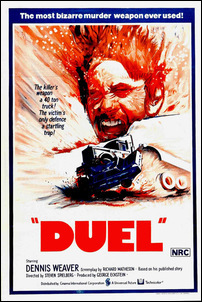 Who can forget Dennis Weaver’s Plymouth Valiant in the classic 1971 road film Duel, knocking horribly and losing power as he tries to outrun the Peterbilt Tanker chasing him? I still have nightmares! Detonation is clearly an important consideration for modified and unmodified petrol engines. But what is detonation, why is it so important and what causes it? When fuel is ignited in a spark ignition engine, the premixed fuel and air catch fire. The flame front then works its way across the combustion chamber, helped along by turbulence, until all of the fuel has been burned. This results in a rapid but steady rise in temperature, and therefore pressure, which does work on the piston and creates power. Detonation happens when the last bit of fuel and air at the far end of the combustion chamber is hit by the pressure wave and radiant heat from the burning fuel. This causes the mixture to explode, rather than burn in a steady flame front. The difference might sound a bit academic - after all, the end result is the same, isn’t it? The explosion sends shock (pressure) waves into valves, pistons and other parts of the combustion chamber. The ping that you hear (or is picked up by the detonation sensor on some cars) is this pressure wave making its way through the engine, to the surrounding air and then to your ears. 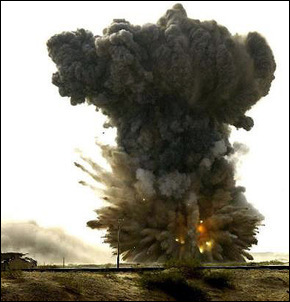 There are a number of ‘knock on’ effects of detonation, all bad. 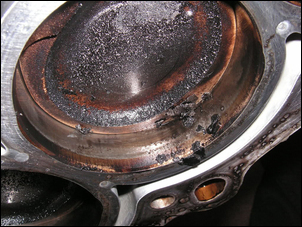 First, detonation can cause serious damage to your engine. You have probably seen melted valves, corroded pistons or broken piston rings, perhaps from your own engine. The pressure wave and associated high heat transfer place enormous strain on engine components. The second effect is a reduction in power. 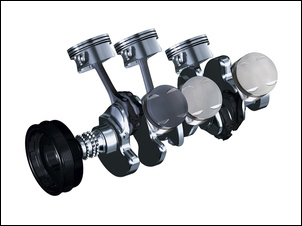 The pressure wave scours the relatively stagnant air which normally protects combustion chamber components, causing much more heat transfer to the cylinder head, valves and piston. This heat is not available to create power and puts additional strain on the cooling system. The final effect is on emissions. The steady progression of a flame front allows fuel to burn efficiently. The conditions in a fuel explosion can cause some oxygen to react with nitrogen instead of the fuel. This results in high NOx and hydrocarbon emissions. Imagine someone hands you a flask of nitro-glycerine to look after. Not a friend, obviously. You would probably want to avoid giving it any shocks and keep it as cool as possible. In this sense, you might think of the nitro-glycerine as having an extremely low octane rating. Alfred Nobel increased the shock resistance of nitro-glycerine by the addition of sawdust to create dynamite, which turned out to be much more stable and therefore safer and more useful. If you want to prevent the mixture of fuel and air in your car’s combustion chamber from exploding, there are two strategies. You can change the explosive characteristics of the fuel by increasing the octane rating, or you can handle the fuel air mixture more gently. Ok, so you already run high octane fuel, or you don’t want to because of the added cost. So how can fuel be handled more gently? The air / fuel mixture is more susceptible to detonation when it is hot. Therefore, keeping things cool will help to reduce detonation. This isn’t just about keeping the intake air cool, although that is important. 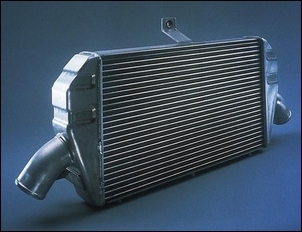 A hot engine will transfer a lot of heat to the incoming air, so keep your cooling system in good condition. Also, the air / fuel mixture heats up during the compression stroke. Keeping compression (including any forced induction) to moderate levels is a critical part of controlling detonation. Fuel mixtures are also sensitive to both pressure and to the rate of pressure rise. If you apply pressure gradually to an explosive mixture, you may set it off. However, you are more likely to set it off if you hit it sharply with a hammer. The same principle applies to fuel mixtures within a combustion chamber. If you think about it carefully, this is also about controlling temperature, since during a rapid pressure rise (a shock) there is no opportunity to dissipate the heat produced. Part of the pressure rise rate is contributed by the piston during the compression stroke. Another major contributor is the initial combustion of fuel itself. When fuel is ignited, a flame front is created, releasing heat and expanding the gas. This expansion sets up a pressure wave which travels across the combustion chamber. When it hits the opposite wall, the pressure wave is reflected and the pressure spike can trigger detonation. Remember that increased pressure in gasses also means higher temperatures. Radiated heat from the flame front also contributes. 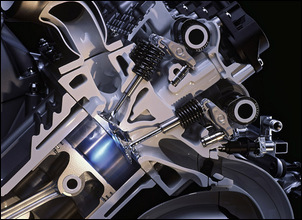 Engine designers have a wide range of tricks to reduce this pressure spike. Compact combustion chambers with centrally located spark plugs help to reduce the distance the flame has to travel before hitting an opposite wall. 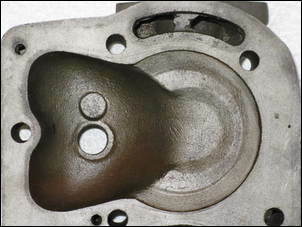 Early flathead engines were particularly vulnerable to detonation because of their long combustion chambers. A design by Harry Ricardo partially countered this effect by locating the spark plug slightly towards the exhaust valve and providing a ‘squish’ zone above the piston, which was some distance away. This meant that the pressure wave from combustion hit an opposite wall which was relatively cool. The squish area also helped to create turbulence in the combustion chamber, which improved normal flame propagation and disrupted the pressure wave. It helped, but these engines were still restricted to relatively low compression ratios. Ignition timing is also hugely influential on the tendency to detonate. Remember that detonation depends on temperature, pressure and the rate of pressure rise. If ignition occurs well before the compression stroke is complete, this causes higher peak pressures and a higher rate of pressure rise as compression and combustion occur at the same time. Retarding ignition means that the combustion pressure peak occurs nearer to, or after, top dead centre when compression is complete. Auto-ignition is when the fuel mixture is ignited by something other than an arc from the spark plug, usually a hot spot within the combustion chamber such as glowing carbon deposits or a spark plug which is the wrong heat range (and so stays glowing). If this secondary ignition occurs at about the same time or after the spark, then the effect is insignificant for modern fuel injected cars. Older carburetted cars may tend to ‘diesel’ or ‘run on’ after switching the ignition off. Auto-ignition which occurs before planned ignition is known as pre-ignition. This advances timing in an uncontrolled manner and is very likely to lead to detonation. The process can be self-propagating, as detonation causes further increases in combustion chamber temperatures and even earlier pre-ignition. Even without detonation, pre-ignition causes an early pressure peak. Very advanced pre-ignition can even cause single cylinder engines to stop due to the development of high pressures during the compression stroke. A multi-cylinder engine with a single pre-igniting cylinder may carry on while suffering serious damage. Modern combustion chamber designs, detergent unleaded fuels and closed-loop fuel injection significantly reduce the incidence of pre-ignition due to carbon deposits. 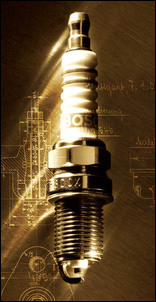 Projected nose spark plugs also help by providing more consistent plug temperatures across a wider range of engine loads. Pre-ignition and detonation are separate phenomenon. However, they are so closely associated with each other it is not surprising they are often interchanged and confused. Pre-ignition can cause detonation by excessive advancing of the ignition event. Conversely, detonation can cause pre-ignition through the creation of hot spots within the combustion chamber. In these cases, it is academic whether power loss and engine damage are actually caused by detonation shock or pre-ignition cylinder pressure during compression. By understanding these processes, you can make better decisions about how to manage your stock or heavily modified engine to avoid detonation. For example, retarding the timing will reduce detonation due to high compression or temperatures. But it won’t help as much where pre-ignition is caused by a spark plug which is too hot. The author has no connection with Harry Ricardo or Ricardo Engineering.